The Coolest, Lightest Weight Suit on the Track! 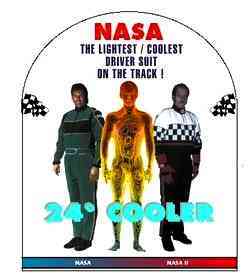 The NASA professional suits are the coolest driving suits on the market today! Our lab-tested, construction techniques assure maximum body heat loss through knit fabric venting. This incredible knit venting system reduces temperatures within the suit up to 24 degrees! (Style I & II are identical except for vertical or horizontal trim/vents.) Available in sizes S through XXXL and short or tall in Black, Red, Blue. Green, Teal, Yellow, Orange, Gray or Purple. A terrific new style with all the great features of the original NASA I suit ! SFI-5, Kevlar Lining / Nomex Exterior. Knit arm bands replace vertical NASA arm vents. Straight epaulets and 1" ribbon accent stripes. Many design options and colors available in standard sizes. Available in sizes S through XXXL and short or tall in Black, Red, Blue. Green, Teal, Yellow, Orange, Gray or Purple. Limited edition colors are available at extra cost.